How many of those were as young as Harper/Machado? I don't know what these two will end up getting paid, but I'd be willing to bet that it ends up being worth it. longer term contracts. Fielder was only 28 and retired by 32. Hayward was only 27 and is one of the bigger busts despite fielding well and that being one of the reasons for the contract. Price and Mauer were sort of young. Catchers break down sooner. How many players would have earned out 10 year big contracts. A-Rod, but Texas had to trade him during his first big contract despite player great. Let's look at production to asses those big contracts. 1) There's not really a definition as to whether a contract, big or small, is ever worth it. When ARod and Miggy were the best hitters in baseball, were their large contracts a good deal for the team, a bad deal for the team, or about right? Is the expectation of these contracts that these players perform like elite All-Stars year in and year out? Is an off-year or two ok if it is offset by the rest of the seasons being truly top-tier? Does it matter at all how well a player performs if the rest of the team around him, through no fault of his own, is abjectly terrible (ARod with the Rangers)? Are wins and losses the only factor or do things like putting butts in the seats and buying merchandise matter, since these franchises are businesses? I tried to review the below contracts strictly from a statistical standpoint as much as possible. 2) I think GMs and owners are too wrapped up into filling a roster with players that give them the most value, and forgot that they should be assembling a roster that is the best they can put out there. Sometimes there's overlap, but sometimes there's not. If the Yankees get any production out of Troy Tulowitzki this year, that's great value for his league minimum, one-year contract. But the Yankees would undoubtedly be a better team for the next several years signing Machado to a huge contract, rather than try to luck out by spot filling that position each year, even if Machado fades toward the back end of his deal. GMs need to be astutely aware of where their team stands for the immediate future, whether there's a window to win or not. If there is, you can't be concerned about what might happen eight or nine years from now. The Mets just announced their starting rotation is set. They're a fringe playoff team. They can hope their starting five stay healthy and that Matz, Wheeler, and Vargas perform well as 3-4-5 pitchers, or they can sign Dallas Keuchel to a deal and make their rotation stronger. The Mets made a number of moves this offseason to indicate they're going for it, so why balk at an opportunity to improve another area of your team? They have room within the luxury tax to make the signing and still resign Syndergaard and/or deGrom in the next two years. 3) Of the 21 contracts I looked at below, I'd be fine with my team signing 11 of those, would dislike 8, and still unsure on 2 (Price and Strasburg). 4) 31 seems to be the age where long term deals offer less of a return. Five of the contracts below started on or after a player turned 31 years old. Four of those look like disasters (ARod 2.0, Miggy 2.0, Cano, Pujols). The only one that looks like it might end up being a good deal is Greinke's. His is also the shortest contract of that group at only six years. Shorter, higher AAV contracts might be best for all parties once a player passes 31 years old. Absent reintroduction of PEDs into baseball, you shouldn't have any expectation of players performing at a high levels at ages 38 or older, so you better have gotten your money's worth before that. 5) Prior to age 31, long term contracts seem to not just be safer for teams, but more often than not exceed value. 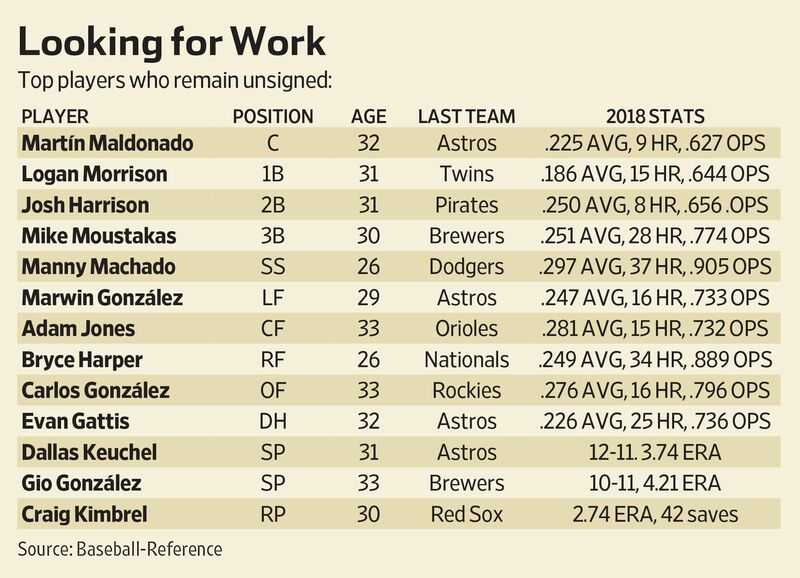 Of the remaining 16 contracts below, I'd argue that only three truly didn't work out (Fielder, Teixeira, Hernandez), with three more still up in the air (Heyward, Price, Strasburg). 6) In younger players, you shouldn't pay for past production, but you shouldn't ignore it either, or look for something that's not there. Cabrera, Jeter, and ARod all had established track records, and it was a pretty safe bet they'd continue to produce at that level through their primes, which they did. Similarly, the Cubs signed Heyward to a contract for the player they thought he'd become, rather than who he showed himself to be. Machado's and Harper's last four years indicate who they'll be for the forseeable future: two of the best hitters in all of baseball. They will unquestionably make any team that signs them better at any price and length. 7) Lastly, you can't predict injuries, so you shouldn't let that factor into your decision to sign a player or not. There's no rhyme or reason why Votto and Verlander can continue to hum along at their ages, while Teixeira and Hernandez just came to a complete halt. Stanton - His contract started in 2015, not 2014. In those first four years, he's averaged 38 HRs, 93 RBIs, a .265/.350/.557 split, a 143 OPS+, and 17.9 WAR. Those counting numbers would be better but for some unfortunate injuries in 2015. Still, he has the 4th most HRs, 11th most RBIs, and 11th best OPS+ in that time frame. That's superior value for a top tier hitter in baseball. There's still a lot of time left on his contract, which goes up to his age 37 season, but absent Teixeira-like injuries, he should keep producing at similar rates through at least age 33. Even if he trails off a bit in the last three years of the contract, which could be eased by DH'ing, 9-10 "Stanton years" will more than pay off his 13 year contract. Great deal thus far, still too much time left to make a final assessment. Alex Rodriguez 1.0 - I'm just going to consider 2001 - 2007 here because the last three years got bought out. 47 HRs, 130 RBIs, .304/.400/.591 average per year, 154 OPS+, 56.4 WAR. It's either him, Pujols, or Bonds as the best hitter for that stretch. That contract unequivocally paid off. Alex Rodriguez 2.0 - He was suspended for all of 2014, retired after 2016, and had only one season where he played 140 games or more. So, right off the bat, not looking good. He averaged 22 HRs, 73 RBIs, with a .269/.359/.486 split, a 123 OPS+, and 23.3 WAR. That WAR puts him in Nick Markakis territory over the same time frame. However, that was playing in half the game as Markakis. That contract provided five years of great value and five years of bad value. The two lost years (suspension, retirement) is the main reason I ultimately put this on the not worth it side. Miguel Cabrera 1.0 - 8 years (2008-15)/$152.3 million/$19.0375 mil per year. If we're talking long term contracts, this has to be included. An average of 34 HRs, 115 RBIs, .326/.406/.574 per year with a 162 OPS+ and a 46.6 WAR. Over that time frame, he had the 2nd most HRs, most RBIs, and second best WAR (defense hurt him). And he averaged 152 games per season. Toss in two MVPs and a Triple Crown. That's best hitter in baseball territory. That contract unequivocally paid off and was an incredible steal for the Tigers. Robinson Cano - The first half of this contract has provided an average of 21 HRs, 82 RBIs, .296/.353/.472 per year, with a 129 OPS+ and 23.6 WAR. Health will obviously play an important factor here, now entering his age 36 season. If he can put up two more seasons closer to 2014-17, this contract will pay off. If he continues to regress, and the next five years resemble 2018, then it won't. Given that he's now on the Mets, I'll bet on the latter. Albert Pujols - This is a past production contract, but not a horrible one. He's been productive offensively (defensively, he's not helpful anymore), not at an All-Star level, but it's not like he's replacement level either. If this were an eight year deal, I'd say it wasn't bad, but I'm guessing the next three years drag it down quite a bit. If he retires early, the Angels could recoup some value here. Contract clearly hasn't paid off. Joey Votto - 2024 is a club option year for $20 million or a $7 million buyout. 22 HR, 73 RBI, .306/.437/.514 per year, 154 OPS+ and 24.5 WAR half way through. His consistency and ability to draw walks and get on base are a huge plus in his favor as he ages. It's certainly a contract that has provided well in return thus far, and I'd say this one is trending toward being worth it. David Price - Way too early to call. The Red Sox are going to have to manage his innings (closer to 2018 levels instead of 2016) if they want to keep him healthy. When he's out there, he wins, with a pretty good ERA and a good K/9. If he can give them three more years resembling 2016 or 2018, the Red Sox come out on top. I think that's possible. Clayton Kershaw - I'm not sure what to do with this one because Kershaw opted out and resigned with the Dodgers. Maybe it's best to look at the whole thing, 2014-2021: 8 years, $243 million (including signing bonuses), $30.375 million per year. We're five years in, and he's been one of, if not the best pitchers in baseball. That first deal has already been more than paid off, so it's just a question of whether adding that extra year (slightly lowering his AAV) will be worth it. Probably, yeah. Prince Fielder - This is a weird situation for a number of reasons. Fielder didn't formally retire, instead going on the 60-day DL, which allowed him to collect his salary, with much of it covered by insurance (before the team and insurance settled, allowing the Rangers to release Fielder). He was traded early on, so the Tigers covered some of it as well. In the five seasons he actually played, he had three really good seasons. Maybe it worked out better because he had to retire? Again, weird situation and kind of an aberration. Max Scherzer - Four years into this seven year deal. It's either him or Kershaw as best pitcher in the game over that stretch, and I'd give the nod to Max. He's also deferring the last three years of his deal (not to the extent of Bobby Bonilla, but still). A great deal for both parties that has already paid off. Zack Greinke - Halfway through this deal. 2016 wasn't his best year, but he was by all measures a top-10 starter each of the past two years. If he continues to eat up innings (200+ each of the past two years) and put up consistent stats (good K/9, BB/9, WHIP, ERA) similar to the past two years, he'll be worth his salary as a top-ten pitcher. If his arm falls apart soon, probably not. So far so good at least. He has also deferred a portion of his salary to ease the hurt. Derek Jeter - I know better than to bash Jeets on this board. The model of consistency, the Yankees got the majority of a Hall of Famer's prime years at less than $20 million per year. Yes, this was a great deal for the Yankees. Joe Mauer - Not his best years, but the Twins got .290/.372/.405 and about 130 games per year. Two great years (2012, 2013), five good to pretty good years, and the only bad year was his first year on contract where he only played about half the season. Not a steal for the Twins, maybe an overall loss, but by no means brutal. Jason Heyward - Not looking good so far. He doesn't strike out or walk a lot. He's a contact hitter without a lot of power (2012 notwithstanding), so his ability to get on base is tied solely to whether he can get balls to fall safely in play. However, his offensive numbers have actually been pretty consistent throughout his career thus far. Those glimpses of him being a breakout candidate, like his 27 home runs in 2012 (which, not surprisingly, coincided with his most strikeouts in a season), seem more like an aberration looking over his entire career. I think the Heyward you see now is the Heyward you can pretty much expect for the next five years (ending at age 33), minus some speed on the basepaths and in the field. Maybe he can reinvent himself as a power hitter in the mold of Jose Batista (not necessarily to that extent). He's certainly got the size and ballpark to do so. Mark Teixeira - The first half of this eight year deal was great: one of the best power hitters in the league, he was well on his way to earning his contract. Sure, his numbers were slowly dropping off each year, but if it continued to be a gradual decline, all would be well. Then a bad injury in 2013 wiped out that season, and he was never really the same for the second half of this contract, minus a brief resurgence in 2015. A net loss that would have been worse but for the first four solid years he put up. Justin Verlander - A 3.38 ERA in the first six years of the deal and only one season where he didn't give his team 32 starts and 200 innings. He's still a top line starter who might earn his vesting option this year (top-5 Cy Young finish in 2019), which would only be for $20 million. While he doesn't have the sheer dominance of a Scherzer, what Verlander has produced is not easy to find. A good deal. Felix Hernandez - This one stings because he's one of my favorite players to watch on an otherwise boring team. He is aging, and not gracefully. At least the Mariners got two great seasons and one really good season out of this contract. They're not going to recoup the full value by any means, though. If the Mariners had signed him to a seven or eight year deal back in 2010 when they bought out his arbitration years, they'd be out from this contract already, and this would look a whole lot different. He reminds me of Johan Santana, in that both had an absurdly dominant nine-year stretch (Hernandez with a 46 WAR, Santana with a 50.4) before just falling apart, sadly. Stephen Strasburg - Way too early to judge, but I'm pessimistic on this one. For that money, you want 30 starts and 185-200 innings per year, which he's done only twice in his nine year career. There are currently too many of his starts and innings the Nationals need to replace. Reasons for optimism would be that he does strike a lot of batters out, without too many walks, so as long as he keeps his arm strength and control, he should be consistent. The contract takes him only through age 34, so plenty of time to redeem himself if he can put up the same numbers, but toss in five more starts per year. I'd be surprised, though, because if he can't go a full season by now, he probably won't ever be able to do so year in and year out. I'll toss one more long contract I thought paid off in for fun: Matt Holliday, seven years (2010-16), $120 million, $17 million and change per year. Six out of seven really solid, consistent years. Power, average, got on base. Definitely a discount. for the team. It is almost a coin flip that giving a player a huge contract will turn out poorly for the team. That means that out of Harper and Machado, 1 will be good and 1 will be bad. One of the interesting things is that Stanton, A-Rod (Texas contract) and Cano were all traded in part because their teams didn't think they could afford the contract. A-Rod was playing great, but it was just too much money for Texas to pay and they could afford to put players around him. Supposedly the Yankees would love to trade Stanton despite putting up good number. You are more positive about some of these players than I would be. Hayward has been terrible hitting. He hits a lot of weak ground balls. He has almost no power for a big, athletic guy. to find players who would be safer to sign than others. It’s almost a coin flip only if you treat all signings equally. I wouldn’t do that, which is why I looked at age. The hit rate in that under-31 group is much higher than post-31. Two of those failures were due to injuries that ended up being career ending. You can’t really compare Machado and Harper to Cano and Pujols. You have to ask if you think they’re closer to young Miggy, Jeter, and ARod or if they’re closer to Heyward. I agree with you on Heyward’s outlook. I was just trying to offer some positive thinking. What I suggested would be a complete overhaul of who he is as a player, so probably not likely. But, hey, nothing is impossible. their income, attendance, and revenues (ticket, TV, concessions, etc.) are versus player payroll, administrative payroll, and coaching/training/scouting staff payrolls. I feel the owners could make a better argument for themselves if they could show that they do a better job marketing a player and giving them top shelf training/scouting/coaching. As a player would you be willing to take a few million less if you were to get the benefit of the best coaching, scouting reports, and top flight training to help your body hold up for the length of the contract? As an owner couldn't you justify lowballing offers and having a smaller payroll by showing that you are running a large company for very little gain or even a loss? In the end the players and owners need to agree with each other on a bargaining agreement, but neither are doing a good job of courting the fans in the realm of public opinion and that is something that is needed to keep the whole thing afloat. Baseball, unlike the other big sports, has guaranteed contracts. If someone signs a 10 year 300 million dollar contract, they are going to get every single penny of that contract, which is worlds different than the other major sports. If a player gets hurt, they still get paid (see David Wright, etc). The owners need to drive that point home repeatedly in the case of Bryce Harper and others. This, it's virtually guaranteeing a work stoppage in the not too distant future. If Bryce Harper turned down 10 years and 300 million from the Nats, he was getting some really bad advice. That doesn't engender a ton of sympathy from anyone. He's not getting screwed over, he has an over inflated sense of his own worth. "In a conversation with The Post, Boras said in Harper’s time with the Nationals, the club’s value climbed more than four times, attendance increased by 600,000 and TV ratings tripled, and that his client had a substantial hand in those rises. "They did not pay anywhere near [Harper’s] $400 million to $500 million in [true value],” Boras said. “This has been great value and is great value." The problem here is not the owners. they mention how fans want to get players signed and want to know who is going to be on their team. Me - not so much. I want my team to make informed decisions that make sense. I think they should give fans a little more credit for being knowledgeable and understanding that Jason Heyward contracts are terrible ideas. I would love to have Bryce Harper but not for 8-10 years at that type of money. I would say that given his youthful age, he is about as close as I would get to signing someone for such a long contract. I still wouldn't do it. That's just too much money for one guy. I would prefer a 3-5 year deal at a premium. And know they have an increasingly weak argument about paying aging players. It certainly looks as though the players are gearing up for some form of stoppage, but I don't know what their proposed changes will be. Salary floor I guess. That has turned into guys staying in AAA out of Spring Training and then coming up in April/May so that the team gets another year of "control". That's the problem, the way the clock starts is dumb, and they have to shorten the length of the arbitration years. I get it, the teams don't want to spend the time and effort to have him leave sooner, but you've already gotten your pound of flesh by getting big time results while paying these guys league minimum salaries. They should also look into arbitration awards, etc. Guys who are elite should start getting paid much much sooner. Considering how crappy he was abusing his big contract last year, he might want to tone it down a little. “You know, striking is the last thing you want to do, but you have to be willing to do it,” Samardzija said. “But I think there are other things before then that can get the ball going the right way." I don’t understand why arbitration figures are so low. For guys like that, arbitration should be producing more than $4M and $7M per year. A starter ERA+ of 216 should warrant more than $17M as well. But when you're coming up from $7M that seems like a reasonable approach by the agent to settle there. Or take Mike Trout whose first year arbitration eligibility settled at $6M and then $16M for the best player in baseball. I assume those were both contractual agreements. But they're based off of market expectations in arbitration, so presumably those have been out of whack. If arbitration numbers were more in line with market value, then players probably wouldn’t care as much. Although that would have huge ramifications on clubs, who could no longer reasonably project their future payroll the way they can now. "The information the player and team can use during the hearing to present their case is governed by Article VI, Section E, Part 10 (a) & (b) of the CBA. This information includes the player's contribution to the team during the past season (e.g., the player's on-field performance and other qualities such as leadership and fan appeal), the length and consistency of the player's career contributions, the player's past compensation, the existence of any physical or mental defects, the team's recent performance (e.g., the team's record, improvement and attendance) and comparative baseball salaries. The panel gives the most weight to each side's presentation of comparable baseball salaries. Here, the player and team can only compare the contracts of players whose service time does not exceed one annual service group above the player's service group. For example, Yankees starting pitcher Michael Pineda, who is entering his second year of salary arbitration, would be compared to other starting pitchers who were also entering their second year of salary arbitration. " players. They should be compared to all baseball players of any service time. They should be making more and older free agents should be making less. I knew the data that can be used has artificial limitations, though they finally started introducing more than just avg/rbi/hr a couple years ago. But the year of service comparison is an inherent bias that is senseless. If the rules prohibit younger players from being judged by the market, obviously all players to be compared to are already artificially low earners. Maybe now that teams spend more realistic amounts on free agents, the union will focus on the real market problem of arbitration. But if it’s really only the stars hurt by that, I don’t know that the union will want to. The MLBPA has one golden goose that they never want to kill. Fully guaranteed contracts. The owners would love to have the NFL model, and the players would have to put that on the table to significantly alter the salary structure. One other thing may play as well. All of the union reps for the 32 teams are grizzled veterans and have the power of influence over the negotiations. By the way, I agree with everything you say, I just dont see it changing. only for their first 5 years because thats when contracts are severely deflated based on on-field performance. They either trade them or allow them to become free agents and then get paid for their accomplistments in Oakland elsewhere. Barry Zito was an example. He was 25-6 and won the Cy Young while making just over league min in Oakland. He left for free agency and got paid big bucks for being a fairly mediocre pitcher afterwards. Teams are smartening up a bit and valuing players based on their projected production. It will be interesting to see if the MLBPA decides to strike over this. who now is talking about reducing his innings if he doesnt get an extension, while he is under contract. A little LeVeon Bell going on there. This is all not good for sports. I know there is a difference between Bell's situation and DeGroms. But this is the first time Im hearing of a baseball player threatening to not play because of a contract issue. I understand the issue from the players perspective. Doesnt seem right that a pitcher of DeGroms ability will not get his first big contract until he is after 30, and thus teams will not be willing to give him a long term contract because of his age. However, I dont like players threatening to not play either. That is not good for baseball at all. I agree with the owners not handing out big contracts to older players. I also agree with the players that they are underpaid for their prime years and now not getting compensated when they hit the open market. There is a flash point, and that would be a guy like Mike Trout holding out after 2 years to get paid what he would be worth on the open market. There would have to be a give and take though - are the players willing to have shorter term contracts and perhaps give up all of the guarantees in order to have flexible pay based on performance at a younger age? Seems like there is a compromise to be reached. But a lot of that was because of public opinion about players and owners. I don't think you'll find anyone who's sympathetic towards Harper not having a deal, after he rejected a 10 year 300 million dollar deal. This isn't owners colluding or anything else. In the eyes of the public, that's a guy turning down an absurdly generous contract. Harper would have become only the second MLB player to eclipse the $300 million mark. On an annual average value basis, the number of athletes averaging more than 30 million a year is small. In terms of baseball history, it would be the longest contract to average 30 million a year by 2 years. Total value would only be eclipsed by Stanton at 325M over 13 years. On a per year basis, it would be one of the top ten annual average value contracts in all of American sports. In baseball it would be the second largest total value contract ever (behind Stanton) and would be tied for the fifth highest average annual value contract ever. Combined, it would be the longest contract to average 30 million a year. And he turned it down flat and his agent said it wasn't close. That stance isn't going to play well with Joe Q Public.